The essential accessory for all Poker tournament fans. 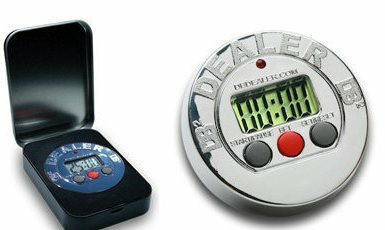 The dealer button with integrated timer means you won't need to look at your watch all the time during a game, as the timer does the work for you thanks to its wide screen and bell that rings one minute before increase of blinds. Many other attributes have been built into this little marvel. We dreamt of it, and they made it... (lifetime guarantee battery included) The Limited Edition Digital Dealer Button's metal case is the exact dimensions of a playing card box and fits easily in a chip case card slot. Among its other attributes, this one has: - a sound alarm one minute before the end of round - length of rounds are adjustable in 5-minute increments - pause button to stop and re-start game at any time. More info about Dealer timer button Limited edition ?